Xiao long bao, Chinese soup dumplings, have become a bit of a culinary white whale for me. 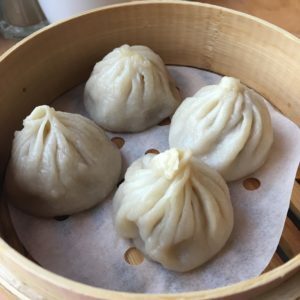 Discussed frequently on food shows, blogs, and the interwebs in general, these dumplings remained elusive while I was living on the east coast. With my move up to Ottawa and its bigger, more diverse population and food scene, XLB suddenly became attainable. And that’s where The Noodle House comes in. 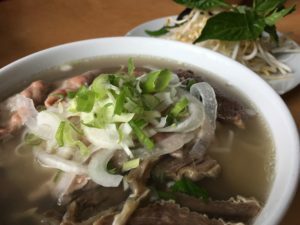 Located on Gladstone a couple blocks west of Bronson, The Noodle House is far enough from the heart of Chinatown that it doesn’t get lost in the noise of Somereset Street’s countless restaurants but is still just a few minutes walk away. After hearing that they carried soup dumplings and were within a quick walk from our apartment, it was an easy choice to go here for lunch with my wife. It was quiet when we arrived, with just a few other patrons there for a mid-week lunch. The space still looks quite new, has minimal décor, and seats 30 – 40. Our friendly server got us set with complimentary tea while we perused the menu. While mainly Vietnamese, the menu has a pan-Asian flare running through it, with some Thai, Chinese, and even Malaysian items showing up. An order of xiao long bao (four for $4.50) was a given, and since it IS a noodle house, we got an order of pho with rare beef and beef flank ($9.50 for a small, 24oz). 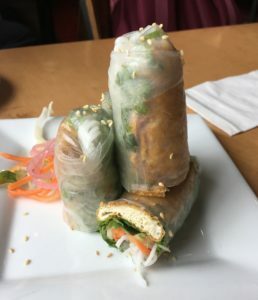 To make the lunch vaguely healthy, we got an order of the vegetarian salad rolls (two for $5.50) and the Vietnamese slaw with shredded chicken ($10). As there wasn’t a big crowd, our food came out in quick succession. The salad rolls were plated nicely, with large hunks of fried tofu, and veggies on full display. There was a pleasant chew to the rice wrapper, and while the fried tofu was somewhat plain on its own, a peanut dipping sauce amped up the flavour. I really enjoyed the Vietnamese slaw. 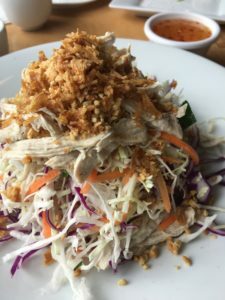 Comprised of shredded green and purple cabbage, carrot and roasted chicken, and topped with a fried onion and peanut crumble, it had a ton of flavour and crunch. A hefty portion meant that we had some to take home as well. Next up was the pho. The rare beef came out with plenty of redness that slowly disappeared as it cooked in the fragrant broth. Strips of flank were nice and fatty, but weren’t hard to chew. With a generous amount of sprouts, Thai basil, and even a chili pepper for add-ins, there was no shortage of flavour. Last but not least were the soup dumplings. We had been warned that these would take up to 20 minutes to prepare, but with all the other food that we had ordered, we weren’t overly concerned. For those unfamiliar with xiao long bao, they are a steamed dumpling originating from Shanghai, which has gelatinized or frozen broth folded into the dumpling along with the meat. When steamed, it turns to liquid and hence the English name – soup dumpling. Using chopsticks, put a dumpling on the provided soup spoon. Bite a small hole in the wrapper to let out some of the steam. After a few seconds, slurp out the broth. And how was my first xiao long bao experience? Delicious! The wrappers were just supple enough to contain the liquid within without being too heavy, while the broth itself really upped the richness of the dumpling. Naturally, the meat benefited from the added moisture of the broth. 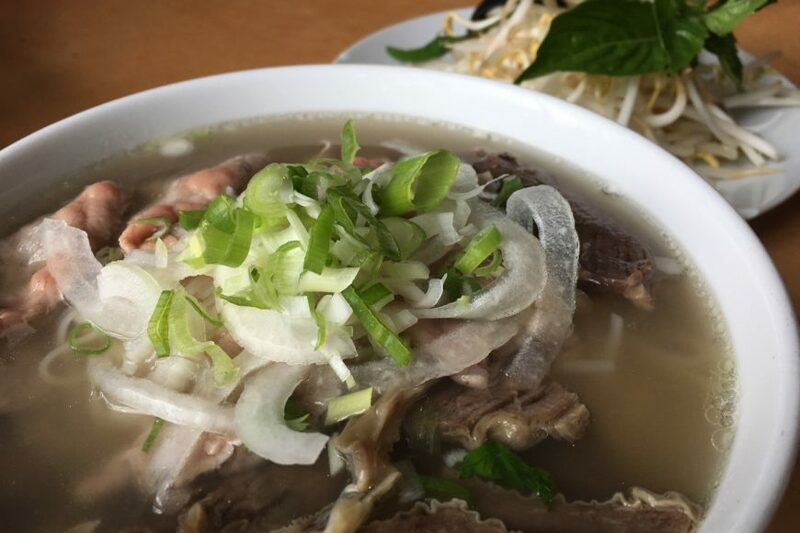 While there may be several noodle houses in Ottawa, this one shows why it is The Noodle House.